It’s not the biggest, the baddest or arguably even the best medium format camera. What it definitely is, however, is possessed of that “Leica magic”. The sensor isn’t stabilised, the viewfinder isn’t electronic and the buttons aren’t even labelled… but it’s an unadulterated joy to pick up and shoot with. An astonishingly tactile and pleasing camera to use, the intangibles overcome the spec sheet omissions. Is 64MP enough for medium format? 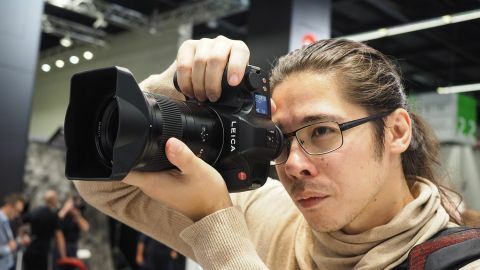 Leica was the first company to show off a new medium format camera at Photokina 2018, with its announcement of the 64MP S3. Since then Fujifilm revealed its 100MP GFX 100S, and obviously there’s Phase One’s 150MP XF IQ4. Of course, raw specs are the least important aspect of Leica products. Phase One’s system may have two-and-a-half times more megapixels, and Fuji’s may have an electronic viewfinder and in-body image stablilisation, but they lack one key feature: that little red circle. Leica’s USP is and remains its luxury appeal. With the S3, just like every other Leica, the battle won’t be fought or won on specs; it’s all about that elusive Leica magic. And in this respect, the S3 delivers in spades. The Leica S3 marks an anniversary for the S-line, being revealed 10 years after the announcement of the S2 at Photokina 2008. The S3 is an evolution of its older brother, as well as the Leica Typ S (007) that succeeded it in 2016. It retains the classic optical viewfinder of its forebears, but increases the sensor size 1.7 times from 37.5MP to 64MP. The latest incarnation of the ProFormat sensor is capable of shooting at 3fps in burst mode, and can reach an ISO of 50,000. Like its predecessor, it also captures DNG raw files. In terms of video, the S3 takes full advantage of its medium format sensor to provide uncropped Full HD and 4K video – which makes Canon’s inability to deliver uncropped 4K on the EOS R even more frustrating. Leica has opted for rounder, fuller, DSLR-style ergonomics, rather than the pared-down-yet-button-heavy design of so many mirrorless bodies revealed this year. Slightly larger than the average DSLR, the Leica S3 is incredibly accommodating to your grip. Your fingers aren’t fighting against the forced minimalism of a smaller frame, giving your digits plenty of ‘breathing room’. The generous size extends to the viewfinder; some may balk that it isn’t electronic, but it’s quite possibly the most perfect optical viewfinder we’ve ever used. Bright, spacious and gin clear, it’s feels tangibly pleasurable to hold up to your eye. Atop the body is a monochrome LCD display, inherited from the (007), which offers the most feedback you’re going to get on this camera; what few buttons and dials there are, save the main power lever, are completely unmarked. So, what if you don’t know which button does what? It’s a bit like the old ‘if you have to ask how much it is, you can’t afford it’. (Somewhat ironically, the price for the S3 is yet to be confirmed, but expect something in the $20,000 region of its predecessor.) Suffice to say, this isn’t a camera for everyone. The lack of inputs is markedly noticeable, next to the raft of button-packed bodies elsewhere on the show floor. That said, after accidently thumbing the touch bar on the Canon EOS R and and bumping the ISO to 40,000 on numerous occasions, it’s nice to be able to just hold a camera without worrying about mistakenly pressing things. Especially when you’re holding a camera that looks and feels as beautiful as this. We used a pre-production body with a Summarit-S 35mm f/2.5 ASPH CS and Summarit-S 70 f/2.5 ASPH CS, the latter of which boasted quick and confident focus, and paired very well with the camera. The Leica S3 is everything you would expect of a new Leica; it’s as inspiring as it is impenetrable, and to fire off a few shots and hear that unique medium format “ker-chunk” punctuated by a pregnant pause is enough to make you wonder whether mirrorless really is the future… even if just for a few moments. An everyday camera for everyday people it’s not, but it’s the highest resolution in a portable system without getting into big studio cameras – and, at the end of the day, it’s got that little red dot on the front. For some people, that’s all that matters.